All Pacestar Software products are based on our core diagramming technology and a common user interface. They also share common diagramming capabilities as well as having special capabilities for their specific task. Each is described below. For detailed feature-by-feature comparison see the Product Comparison Guide. EDGE Diagrammer is our most versatile diagramming tool. Create a wide variety of technical, presentation, and design diagrams efficiently and with the highest quality results. EDGE Diagrammer is all you need for block diagrams, flow charts, org charts, family trees, data flow diagrams and more. Free extension packs are available to provide support for many different diagramming methodologies. 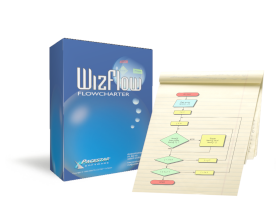 WizFlow Flowcharter is all you'll ever need if you just do flowcharts. It's easier to use than anything ever published for this task. 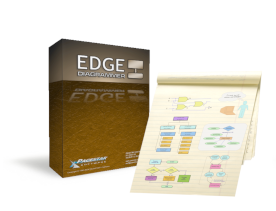 One of the best diagramming values in the industry, it has many of the features of our more comprehensive EDGE Diagrammer product but at a reduced price. WizFlow supports all popular flowcharting standards including classic IBM, Ansi R-54, FIPS, and more. With LanFlow you can create great looking LAN, internet, telecommunications, and computer network diagramming with the minimum effort. In just minutes, you can plan and document a network and communicate flows and processes. LanFlow contains support for some of the basic block diagramming techniques in EDGE Diagrammer plus extensive network diagramming support. 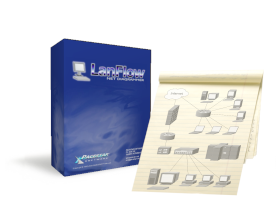 LanFlow is the easiest and most extendable solution for managing and documenting your network. 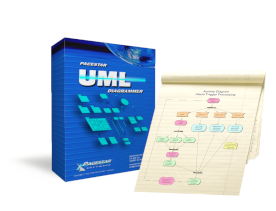 Pacestar UML Diagrammer is a great simple tool for creating and maintaining Unified Modeling Language diagrams. Create all kinds of UML diagrams including Activity Diagrams, Interaction Diagrams, Component Diagrams, Class and Object Diagrams, Use-Case Diagrams, Sequence Diagrams, State Charts, Package Diagrams, and Deployment Diagrams, plus custom design diagrams. Packed with aids to make UML diagramming easy with no expensive training required.